It’s difficult to put out a newspaper when a major event is still under way. 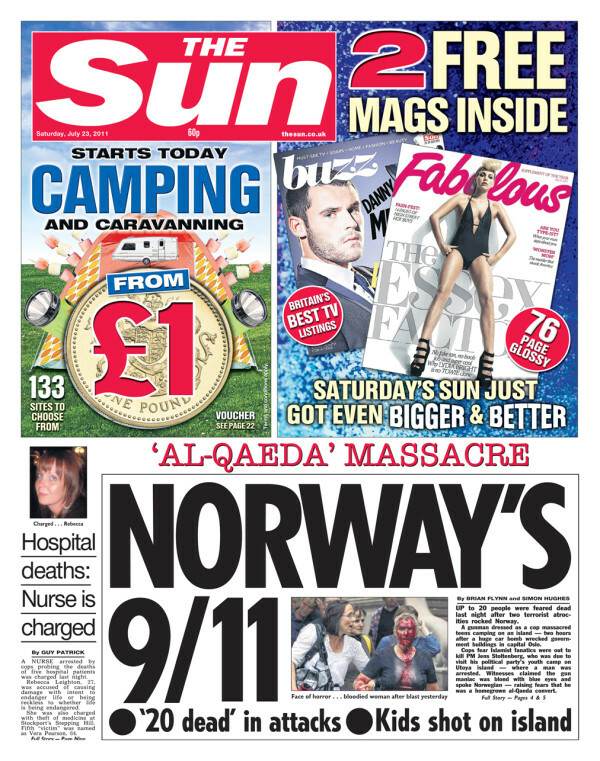 So it’s totally understandable that The Sun has the Norwegian death count at 20, when it’s now estimated at “at least 81” (Guardian). It’s also understandable that many people last night, before the full facts emerged, thought this could be an al-Qaeda attack. It’s not, however, acceptable to attribute the attack to a particular group when there is no evidence. EVEN IF YOU DO PUT IT IN INVERTED COMMAS. Blond? Blue eyes? Norwegian-speaking? While those “fears” were not entirely unjustifiable, there could be plenty of other explanations. I am working at a national newspaper today. I mentioned this, on the subs’ desk. One person responded that “well, al-Qaeda aren’t likely to mind” and another said “you can hardly lower their reputation”. Fair, and fair. But what about relations between religious groups in our own country? Are they worth jeopardising, for a fiction, for a headline? It is a sad enough day, without this. The later edition has been changed to use the words “hunter killer” instead. Edited to add: The killer later turned out to be Anders Behring Breivik, a Norwegian far-right terrorist. He killed 77 people.